On social media (requires following on Twitter or joining Facebook). Not Receiving Calls from ETFO? Not Receiving ETFO’s CB eNewsletter? Looking for ETFO Bargaining Updates on Social Media? Not Receiving Correspondence at Home from ETFO? If you didn’t receive a telephone call on the evening of November 5, 2018 from President Hammond informing you about ETFO’s online survey for central bargaining goals, then it’s possible ETFO doesn’t have your current home address on file. To update your telephone number, contact ETFO’s Member Records Department at Trecords@etfo.org. In your email, please include your ETFO Member ID Number, as well as the contact information you would like to have updated. You may have inadvertently unsubscribed from the CB eNewsletter. 1. I used to receive ETFO’s CB eNewsletter, but I no longer receive it. Go to this online form and subscribe to one or more of our public eNewsletters. Be sure to complete the subscription process by clicking the link in the email that is automatically sent to you after you fill out the online form. Once you have subscribed to one of our public eNewsletters, please send an email to signup@etfo.org to inform us that you have re-subscribed. Please include your name, your ETFO Member ID Number and your email address. 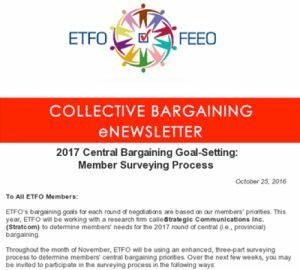 We will confirm that you are an ETFO member and will manually add you back to the member-only list. 2. I have never received ETFO’s CB eNewsletter. ETFO probably doesn’t have a current email address on file for you. Contact ETFO’s Member Records Department at Trecords@etfo.org. In your email, please include your ETFO Member ID Number, as well as the information you would like to have updated. ETFO’s Collective Bargaining (CB) Facebook group is a private space where thousands of ETFO members share ideas and get information about collective bargaining issues. The group is restricted to ETFO members, and is moderated by ETFO Collective Bargaining staff. ETFO has three Twitter accounts that members can follow for collective bargaining-related information: @ETFOeducators, @ETFOpresident and @ETFOcb. To sign up for Twitter, go to http://twitter.com and find the sign up box, or go directly to https://twitter.com/signup. You don’t have to join Twitter in order to follow Twitter conversations. Just visit http://search.twitter.com/ and enter a few keywords (e.g., “ETFO”) or a Twitter account to see recent tweets that relate to those words/account. 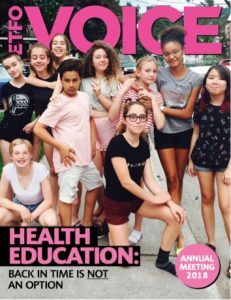 If you haven’t received the fall 2018 issue of ETFO’s magazine, Voice, then it’s likely we don’t have your current home address on file. To update your address, contact ETFO’s Member Records Department at Trecords@etfo.org. In your email, please include your ETFO Member ID Number, as well as the information you would like to have updated. 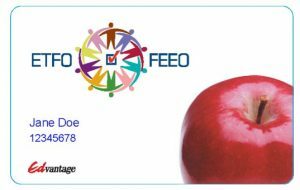 Your ETFO Member ID Number is located on your ETFO membership card (i.e., the white card with the red apple).